Chuck Hagel was the 24th Secretary of Defense, serving from February 2013 to February 2015. He is the only Vietnam veteran and the first enlisted combat veteran to serve as Secretary of Defense. 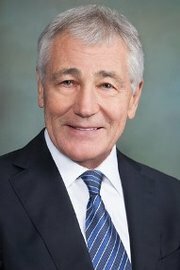 Hagel also served two terms in the United States Senate (1997-2009) representing the state of Nebraska. Secretary Hagel is Co-Chair of the PBS National Policy Advisory Committee and serves on the Nominating and Corporate Governance Committee.